Design bloggers Monica and Jess turn a couple's basement into an updated and chic space. They used a few tricks of the trade to get a high-end look in the room on a budget of just $600 to $800. Monica and Jess are always looking for a challenge. So when they received a call for help from a couple looking to transform their basement, they couldn't pass up the opportunity. But with a $600 to $800 budget, they know they will have to renovate it at a bargain basement price. Homeowners Aaron and Courtney have high-end taste and have sent over some inspiration photos representing what they want in their basement space. It would cost thousands of dollars to create the modern, rustic style that the homeowners desire. So, Monica and Jess have their work cut out for them. They plan to DIY their way to a custom look in the room for less! First up, Monica and Aaron get to work by building the bar out of reclaimed shutters and a door that they picked up at a salvage shop. Monica and Jess already hit a major bump in the road -- they were really hoping to use the homeowners' existing flooring, but once they got in the space, they realized it wouldn't work with their plan. Now they have to find a new flooring option that fits within their budget. Jess and Courtney begin to modernize the space by painting the cabinet doors with five different colors that will draw attention to the wall. To find room in their budget to renovate the outdated flooring, Monica and Jess look to make use of a furniture piece that is already in Aaron and Courtney's house. Jess finds a piece in the guest room that will help their budget and with Courtney's permission, they're able to free up enough money to do something with their floor. 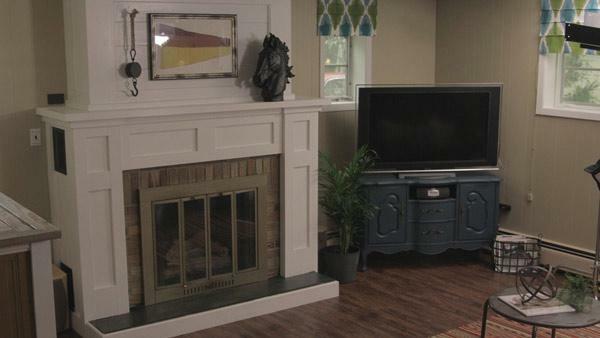 In Aaron and Courtney's inspiration photo was a high-end fireplace, but Jess has an idea to update their existing fireplace. By building on top of the fireplace and covering it up with molding, Jess is going to give Courtney the high-end look she wanted but for way less money. Next up, Monica gets to work on her homemade curtains. She uses a patterned fabric that is inexpensive to make faux Roman shades. Monica and Jess had to be really budget conscious with the flooring that they chose, so they went with a vinyl that looks like hardwood. It was less than $1 per square foot. Since their old flooring was clean and level, they installed the new floor directly on top of it. Meanwhile, Jess and Aaron bring in a new backsplash for the behind the bar that's actually peel and stick stainless steel tiles. After two days of painting and some creative spending and tricks, designers Monica and Jess have finished the complete transformation of Aaron and Courtney's basement. The new look is an updated space for Aaron and Courtney that incorporates the existing elements in the room. Additional color and new flooring was sorely needed. The homeowners were speechless that Monica and Jess were able to do so much with so little. With only $600 to $800 to spend, this basement went from outdated to fully updated for only $794. Designers Monica and Jess meet with the homeowners to discuss their plan for the couple's outdated basement. Want a high-end bar without the expensive $3,000 price tag? Learn how to build your own for only $100! With old shutters and doors from a salvage shop, you don't need a ton of money to have great style. If you don't like your brick fireplace, never fear! You can completely change the look and style of it with some wood and carpentry for much less money than hiring someone else to do it! There is absolutely no easier way to install a backsplash than by using peel and stick backsplash tiles designed for that very purpose! Anyone can do this with little to no DIY experience! Get step-by-step directions and see detailed photos of the DIY projects from the basement makeover. See how Monica and Jess transformed this basement from outdated to stylish.